Welcome to ‘Jane Harries Garden Designs’. I offer you garden design online, ie by post, email and phone, so you save money on a professional design which is specifically produced to your requirements. I can provide advice, designs and planting plans for any size of space, from one flowerbed to a full-size garden. I work closely with you so you have something that suits your needs and tastes – from a traditional cottage garden to a modern city garden. To find out how, and get an idea of costs, see How it Works. To see examples of my work, go to Projects. Gardening is a life-long learning process! To find out what I am learning now, go to my blog. My approach is to work with the character of the space you have, and that around it, rather than put in something out of context (which costs more!). 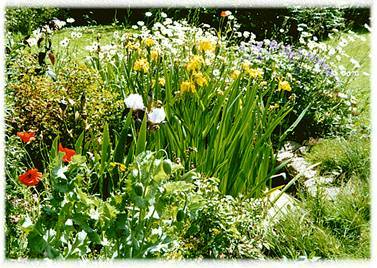 I favour gardens which emphasise nature, though they may have an urban or rural character. I also want to make the garden work for you so everything has its place and is practical to suit your lifestyle. NB: I can also offer a face to face service in South Northamptonshire, so do get in touch if you are in the area. Jane planned our small townhouse garden using photos we provided and a well thought-out questionnaire to get a feel for what we wanted and what was achievable in the space. Jane sent through a plan which was well laid-out and easy to follow, which we took to the nursery she recommended. “Jane provided a complete garden design by post. The end deliverable was a surprise so we communicated almost entirely by email, and it was a complete success. Jane is extremely knowledgeable about garden design and was always prompt in responding to questions, queries and general email comms. I thoroughly enjoyed the process! I felt she understood our brief well and went the extra mile in creating a pinterest board of photo ideas to accompany the design, as well as sketched options and a scale plan of the final design. I loved her sketches so much I had to ask her for some colour versions of the final designs as they bring to life her ideas so well, visually. Jane has kept in touch since, and kindly offered her support and advice should any questions come up once we complete our extension and move on to the garden, over the coming months.